My most recent Sketchmob commission. This one is from a repeat client who I really enjoy working for. They stretch my limits a bit and really like the results, so I’m happy to keep stretching. I’d like you to draw me a scene with two subjects. The first is a frost ogre. It stands about eight feet high, built extremely thick with very wide shoulders, chest and arms. Blue horns and long tangled grey hair top its head and its skin is a pale blue. The ogre’s eyes are white and featureless, giving it the appearance of blindness, but its eyes are very sharp and adapted to ignore glare on the snowy tundra. He wears a mishmash of armor taken from smaller victims secured to his simple garments and carries a mace with a head on it shaped like the picture I attached. The ogre has made its lair in a huge room full of ancient goblin machinery, huge pipes, valves and controls. The floor is a metal gridwork. There are suspended metal stairs leading up out of the room. The second figure is the mighty Thubrall, one of my favored heroes. 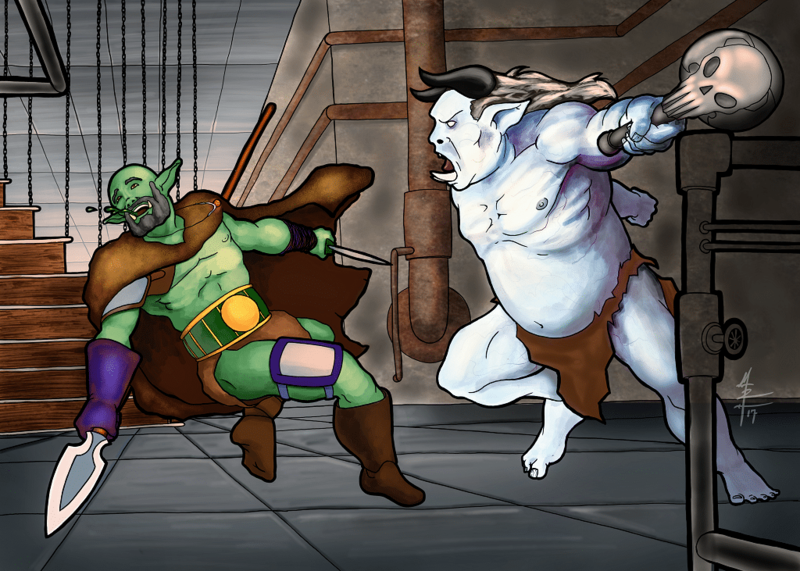 He has just gotten clonked by the ogre and is flying through the air, perhaps some green orcish blood as well. He wears a bearskin cloak and carries a huge magical spear and a long hunting knife. He also has a stubbly black beard and wears a huge red jewel set into a silver women’s bracelet around his neck on a leather thong. So basically Thubrall rushes in to jab the ogre with his spear and gets knocked for a loop and the drawing is at or just after the point of impact when he’s right off his feet. The ogre’s horns / clothes. Shame on me for not referring back to the request description more frequently than I did. I got focused on our half orc hero and the costume on the ogre suffered for it. I say suffered – the client was happy – but now that I’m rereading the description, it’s… not accurate. Those damn stairs. I should have found a reference. I don’t like them as they are. The colors / lighting. I could have kept mucking with it forever. To quote my favorite artist: “Art is never finished – only abandoned.” ~Leonardo DaVinci. See below for an auto adjusted version of the colors / levels. It shows how far off I was. Better, perhaps, than I’ve ever done before, but still far off. That said, I’m learning a ton when I do color work. I’ve watched countless hours of Youtube videos on color theory, lighting, and other related videos, but it’s one thing to feel like you understand what they’re getting at in a video and another thing entirely to replicate it yourself. I’m getting there, but as I’ve read SO many other artists say: it’s taking too long. This was done entirely in Procreate on my iPad Pro with the Apple Pencil. It’s a tool set that I’m growing pretty comfortable with, and the portability can’t be beat. I’ll be posting a process video as soon as I can get it edited together. If you would like to commission an illustration of your own character, check out my Sketchmob page. If you would like to support me in a more general sense (with a wide range of benefits) – check out my Patreon page. Tagged character portrait, color, commission, frost ogre, half orc, sketchmob. Bookmark the permalink.